This book is about an eerie entertainer who specialized in the supernatural. Bill Neff, called "The Master of Many Haunts," brought to his midnight audiences an assortment of zombies, goofy spooks glamorous ghosts, and other varied and weird spirits. Newspapers proclaimed, "Neff's show makes eyes pop, pulses hop, and hearts skip a beat." Author William V. Rauscher presents an incisive and penetrating look at a complex man who succumbed to his own creation. With a forward by McCarl Roberts, Pleasant Nightmares is the story of one of the best spook show magicians of his time whose theatrical attraction was entitled "Madhouse of Mystery," a show that guaranteed suspense, shudder, shakes and shivers. $60 plus shipping and handling $3.95 US, $9.95 International * Mastercard & Visa accepted. We find it fascinating not only because Mr. Rauscher has researched every aspect of this performer's life, but because of his attempt to help us understand this very complex man. The book is beautifully produced. We love biographies and we are sure this one, albeit a somewhat tragic story, is a winner. 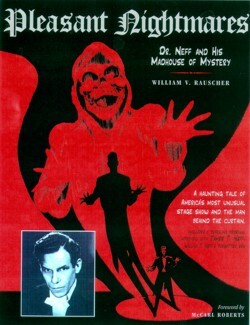 Bill Rauscher has brilliantly documented a small but significant era in mid-twentieth century American stage magic � the �spook show.� His focus is Bill Neff, a talented but tragic figure who was undoubtedly the greatest of the �ghost masters.� This meticulously detailed book covers all aspects of the �Dr. Neff� show from the illusions presented, the working details of the obligatory �blackout� (a particularly fascinating chapter written by Neff himself), to the booking of the show in theatres large and small throughout the USA. It is required reading for anyone interested in the arcana of American stage magic. I learned a lot from it and cherish my copy of this large and beautifully produced book. It is an incredible book!�Very balanced account of both Neff as performer, husband, and father. Production values are very high � worth every penny! I couldn't put it down once I started reading it. I would highly recommend the book to all magicians. Rauscher's book on Bill Neff was just terrific. I loved it. A chilling story but so well presented. A truly wonderful biography. I have recommended it to several magicians who will certainly enjoy it as well. Eugene Burger, Philosopher, historian of religion, lecturer, author and magician. I really enjoyed the Neff biography. Amazing information, and it answered so many questions I always had about this mysterious performer. It's had such great "buzz" among my friends in magic that I felt as if I'd been the last fellow to read it. I enjoyed every minute. Jim Steinmeyer, Noted illusion inventor and designer, author and consultant to Broadway producers. There are many magic writers that could have presented Neff�s history and accomplishments. William Rauscher offers us his soul. In William Rauscher's excellent 'Pleasant Nightmares' he has effectively lifted the veil on an American showman that magicians know only from his sensational promotional photos and faint descriptions of his spook show routines. Author Rauscher tells the complete Bill Neff story ---warts and all---that makes for captivating, if sometimes uncomfortable, reading. Much can be learned from the mistakes of his personal trials and tribulations, but magicians who are wise could learn much from what he did on stage that was just right...and now forgotten. My apologies to all other authors of magic books I have ever read or even seen. Truly, I have to say this�when I opened the box and saw this presentation, it took my breath away! The size! The color! The case wrap cover and binding. Everything as if I had had the life to warrant such a book that I would want MY book to look like. It is stunning. In size as well�..Terrific VALUABLE stuff available nowhere else. A lot of Magic is covered and the magnificent showmanship Bill Neff was capable of. But, it also gets deep into the dark side of his troubled performer..the alcoholism, the terrible treatment of his long suffering wife and the �forgotten� son he never wanted. This a book for the ages folks�it uncovers so much about a time and personality like no other�just get it�.this is not fluff..you will not be disappointed. I found this book both extremely fascinating and hard to put down. Within two nights, I read the entire book and cannot recommend it highly enough. It is filled with great information and fantastic, vintage photographs. The Neff book is �Wand-erfull! The Neff book is a masterpiece and will live as long as there is a magician with a top hat, and a rabbit to pull out! I read the Neff book and think it�s terrific! As a matter of fact, I�m reading it a second time. The book is lavishly illustrated with hundreds of photographs of Neff throughout his career. From the young student working with Jimmy Stewart, through the height of his fame on stage, to his sad, slow decline. Neff�s unpublished manuscript with his thoughts about producing an effective �blackout is alone worth the price of the book�.Overall, this is a story that is both inspiring and heartbreaking. It will serve to remind you that everything in magic is an illusion. Unfortunately for Bill Neff, the illusion became his reality. Highly recommended.